If you are an iPhone user, you might have tried backing up your files with iTunes or iCloud. However, some people are looking for a better way to backup iPhone without iTunes or iCloud as these methods might stuck with some unknown errors or carry a some other disadvantages. For instance, iTunes can't support selective backup functions and will overwrite the previous backups; iCloud offers merely 5GB of storage for free and you will need to pay if you need more. To avoid such problems, we have come up with this post and will tell you how to backup iPhone without iTunes or iCloud. Let's start now. When you are looking for a way to backup iPhone without iTunes or iCloud, the most recommended way would be using iMyFone D-Port Pro. 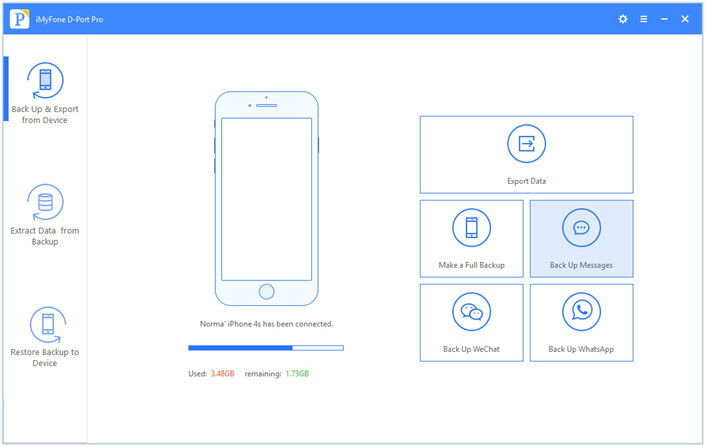 It is an incredible backup and restore tool designed with the intention of allowing users to create full and partial backup of their iOS data. This tool can be considered as the best iTunes/iCloud alternative since it fully takes care that the existing backup files and would not overwrite the new backup files as opposed to iTunes. Moreover, it is completely supportive to Mac and Windows operating systems as well as latest iOS versions and models. Here is how you can use this tool to backup your data freely. Step 1 – Start with downloading iMyFone D-Port Pro in your computer and install it. Launch it then and enter into the main interface. Now, get your iPhone connected to the computer and from the left panel, you need to click on 'Back Up & Export from Device' option. 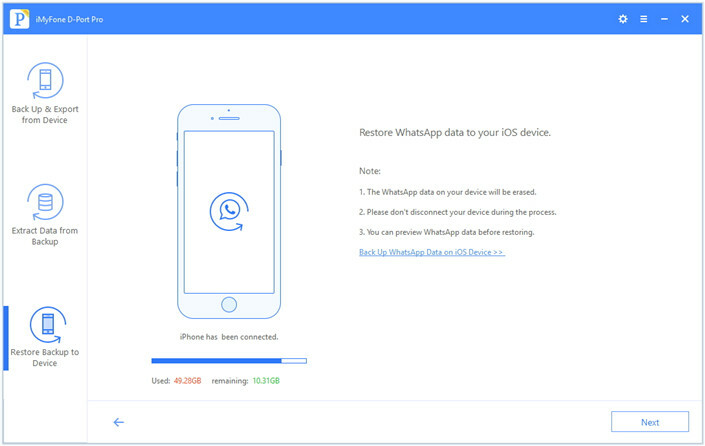 Then you can backup your whole iPhone or just backup WeChat, WhatsApp, Messages. 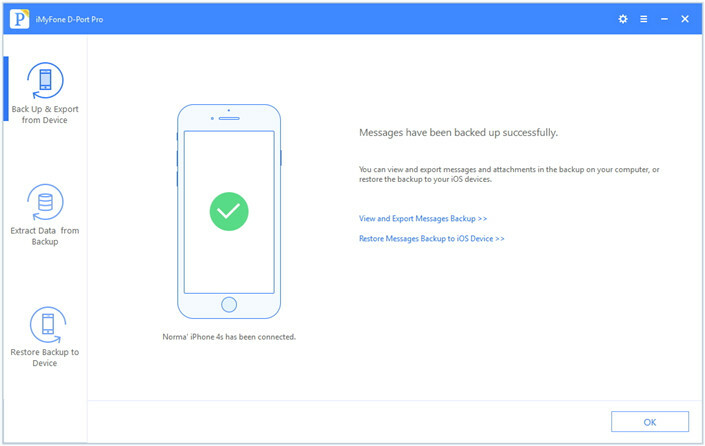 Step 2 – The next screen will ask about the confirmation of backup. For this, just proceed to click on 'Back Up' button given at the bottom right corner of the screen. Step 3 – Keep the device connected during the backup process. On accomplishing of the process, you will get notified that your data is backed up successfully. Not just for backup, iMyFone D-Port Pro also works for the purpose of selectively restoring the data. 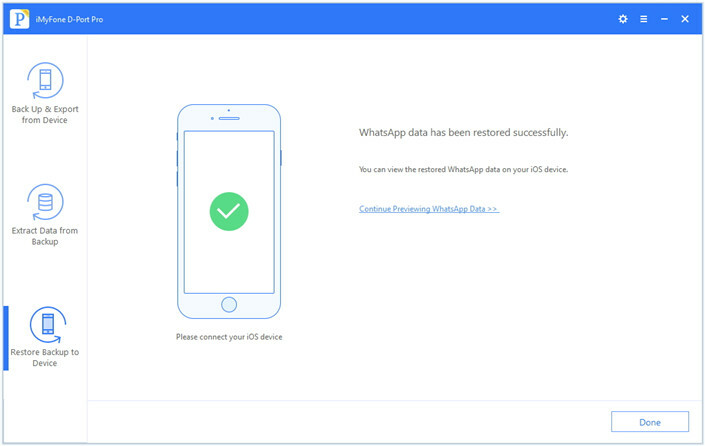 You can restore WhatsApp, WeChat and messages separately for now with this tool. With the new version of D-Port Pro, you will be able to work with more data types for restoring. We will now explain you how you can take help of iMyFone D-Port Pro for restoring your data. 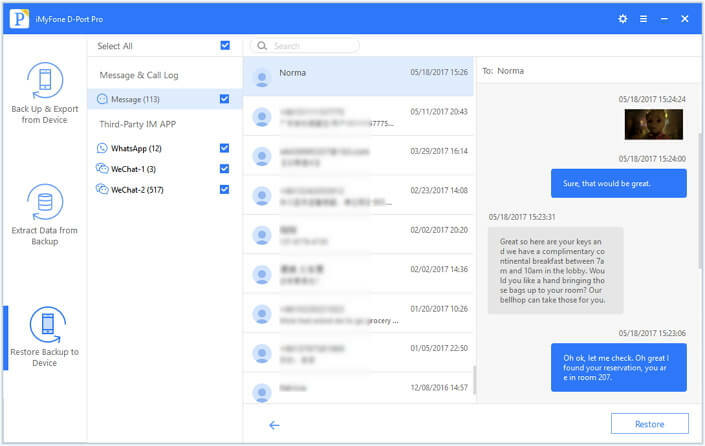 Step 1 – Run iMyFone D-Port Pro and from the main interface, go to the 'Restore Backup to Device' option located at the left panel. Then, make a connection between your PC and your iPhone. Step 2 – Now, select whatever i.e. 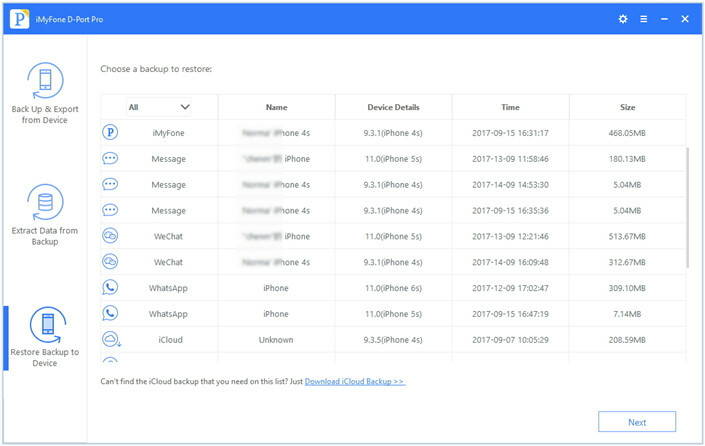 WeChat, WhatsApp or Messages backup you made. Hit on 'Next' now to get into the next screen. 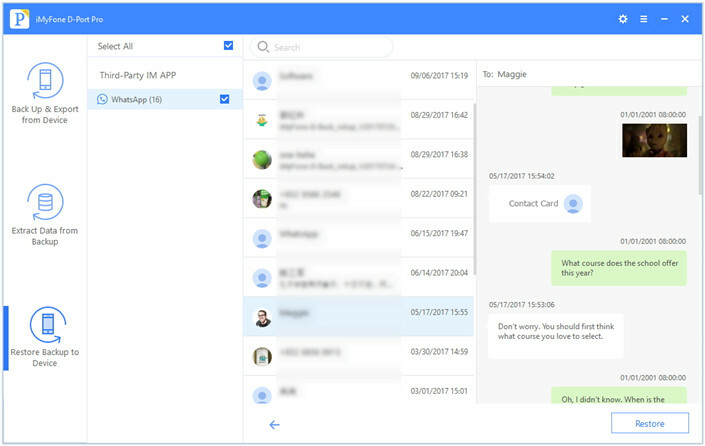 Step 3 – From the new screen, click on 'Next' and your WeChat/WhatsApp/Messages backup will start scanning. After it gets scanned, you can preview your backup and finally click on 'Restore'. The process is complete now and you will get to view your data in your device. These steps will let you know how to restore your iPhone selectively when made backup with iMyFone D-Port Pro. Step 1 – Start with opening the program in your computer and click on 'Restore backup to Device' option as we did in the above process. There will be a list that will appear after you click on the requested option. The list will have all the backups you have made till now on your computer. Click on the preferred iMyFone backup file and choose 'Next' option. Step 2 – Now, get your device in connection with your computer and look for the 'Restore Partial Backup' option given at the right side of the interface. 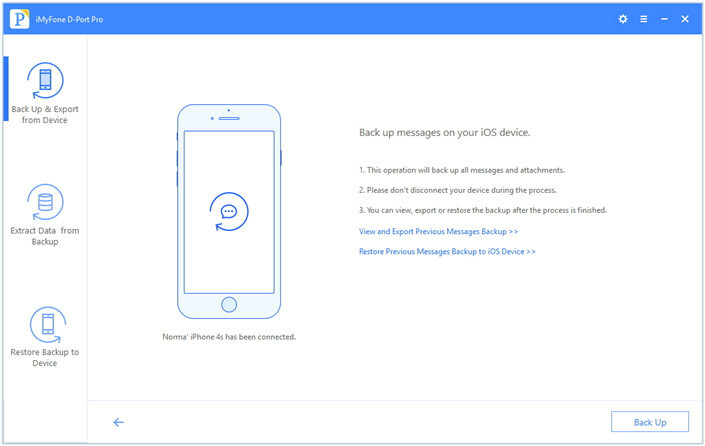 Click on it to proceed the selective restoring of iMyFone Backups and then hit on 'Next'. Step 3 – The program will now ask you to select the data types that you wish to transfer. Select the one which is required to be restored and click on 'Next' so that your selected data start getting scanned. Step 4 – Once your selected data from the backup file gets scanned, you can preview your data prior to restore. After previewing gets done, you can click on 'Restore' to initiate restoring process. Within a while, your files will be restored without overwriting any previous data. That's about it. We now hope that you have full understanding on how to backup iPhone without iTunes or iCloud using the easiest and the best way possible. 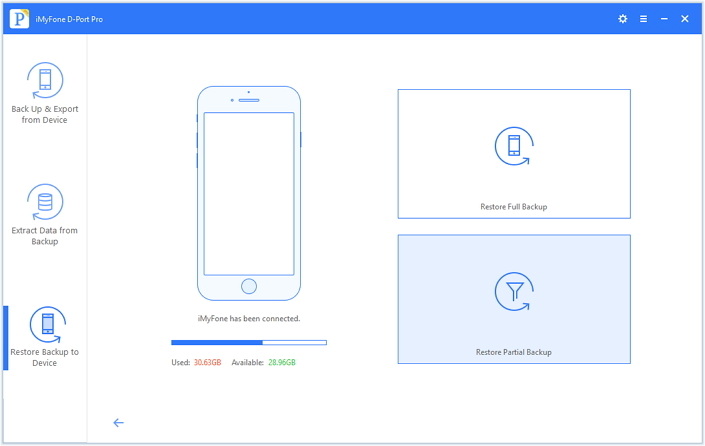 iMyFone D-Port Pro not only can help you to backup iPhone flexibly but also effectively helps you to restore the data contained in a backup file back to your device, no matter if it is an iTunes or iCloud backup or an iMyFone backup.